WOW! What a way to kick off the new year! 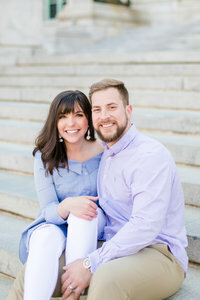 This weekend, Marie headed to Charlottesville for Maggie & Jack’s Charlottesville engagement session at UVA! It was absolutely perfect and you wouldn’t even know that it was COLD during this entire session. Maggie looks like a dang model and of course Jack is daper as ever in that classic gray suit. Natural models we have on our hands over here! Marie had the sweetest things to say about these two! “I had the sweetest couple to kick off 2019 with this weekend!! Maggie and Jack are beautiful people inside and out and I cannot wait for their wedding this October. They were full of jokes the whole time which meant we got along perfectly. Seriously, this was such a fun session because they were naturals in front of the lens! Maggie is a pro dress twirler and Jack has a killer smoulder and nuzzle so they made my job easy. Their proposal story is one for the ages because it literally involved the CIA. I mean how many people can say that?! He popped the question in Old Town Alexandria where his aunt and uncle were having their retirement party from the CIA. Jack knew this was the perfect place to ask her to be his wife because it was where they had their first date…and first kiss! Of course she said yes and now they are preparing for their wedding in Charlottesville this fall.